Treat yourself or a loved one to the L'Occitane Sweet Almond Wishes Discovery Kit; a carefully curated selection of five hero products that work in tandem to cleanse, moisturize and comfort skin. Housed in a cosmetic bag decorated with colourful hand-painted illustrations by Rifle Paper Co.
A light and fine body oil that helps skin feel firmer and smoother. Infused with Almond and Camelina Oils, the luxurious blend enhances suppleness and comfort, whilst leaving skin tighter and younger-looking. Expect silky smooth skin with a subtle scent. Enriched with Almond Milk and Oil, the lightweight cream absorbs quickly into skin to protect and replenish, without greasy residue. Hands feel smooth and comfortable with a luxurious scent of fresh Almond Tree Flowers. Suitable for use on the hands and body, the soap bar leaves rough skin feeling clean and smooth. Utilizes ground Almond shells to gently buff away dead skin and impurities without stripping moisture. Ideal for eliminating dry skin on the elbows, knees and feet. The brand's best-selling 'miracle in a jar'. Delivering long-lasting moisture and hydration, its blend of Walnut Seed and Almond Extract helps to firm and tighten skin for a smoother, more refined appearance. Lightweight and quick-absorbing with no sticky residue. Transforming into a rich, luxurious foam upon contact with water, the award-winning formula gently cleanses and softens skin, whilst hydrating and nourishing for long-lasting comfort. Kind enough for even the most delicate skin. Oil: Apply in the morning and evening all over body. Hand Cream: Use a small amount of cream into backs and palms of hands and gently massage in circular motions. Apply as often as often as needed. Soap: Wet soap and lather in hands. Concentrate: Use daily, in the morning and/or evening, by massaging into the skin with circular motions, making sure to move from bottom to top. Shower Oil: Apply to dampened skin, lather, and then rinse. 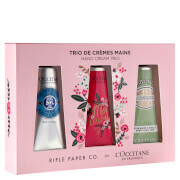 Hand Cream: Aqua/Water, Isononyl Isononanoate, Glycerin, Cetearyl Alcohol, Butyrospermum Parkii (Shea) Butter, Polymethyl Methacrylate, Prunus Amygdalus Dulcis (Sweet Almond) Protein, Prunus Amygdalus Dulcis (Sweet Almond) Oil, Cocos Nucifera (Coconut) Oil, Rosmarinus Officinalis (Rosemary) Leaf Extract, Helianthus Annuus (Sunflower) Seed Oil, Ceteareth-33, Mannitol, Cetyl Alcohol, Polysorbate 60, Cetearyl Glucoside, Hydroxyethyl Acrylate/Sodium Acryloyldimethyl Taurate Copolymer, Xanthan Gum, Sorbitan Isostearate, Glyceryl Stearate Se - Ethylhexylglycerin, Phenoxyethanol, Chlorphenesin, Benzoic Acid, Dehydroacetic Acid, Polyaminopropyl Biguanide, Tocopherol, Parfum/Fragrance, Limonene, Linalool, Coumarin. Soap: Sodium Palmate, Sodium Palm Kernelate, Aqua/Water, Glycerin, Prunus Amygdalus Dulcis (Sweet Almond) Oil, Parfum/Fragrance, Sodium Citrate, Prunus Amygdalus Dulcis (Sweet Almond) Shell Powder, Citrus Aurantium Bergamia (Bergamot) Fruit Oil, Phenoxyethanol, Potassium Sorbate, Sodium Benzoate, Tetrasodium Glutamate Diacetate, Limonene, Coumarin, Linalool, CI 77891/Titanium Dioxide. Concentrate: Aqua/Water, Isononyl Isononanoate, Cyclomethicone, Methylsilanol Mannuronate, Glycerin, Cetearyl Alcohol, Caprylic/Capric Triglyceride, Prunus Amygdalus Dulcis (Sweet Almond) Oil, Glycerin, Prunus Amygdalus Dulcis (Sweet Almond) Protein, Prunus Amygdalus Dulcis (Sweet Almond) Seed Extract, Juglans Regia (Walnut) Seed Extract, Cetearyl Alcohol, Parfum/Fragrance, Cetearyl Glucoside, PPG-26 Buteth-26, Carbomer, Sodium Polyacrylate, Phenoxyethanol, Chlorphenesin, Mannitol, Ethylhexylglycerin, PEG-40 Hydrogenated Castor Oil, Menthyl Lactate, Sodium Lauryl Sulfate, Glyceryl Polymethacrylate, Biosaccharide Gum-1, Cetearyl Glucoside, Sodium Metabisulfite, Sorbic Acid, Glyceryl Stearate Se, Xanthan Gum, Benzoic Acid, Dehydroacetic Acid, Tocopherol, Polyaminopropyl Biguanide, Limonene, Linalool, Coumarin. Shower Oil: Vitis Vinifera (Grape) Seed Oil, Tipa-Laureth Sulfate, Laureth-3, Caprylic/Capric Triglyceride, Parfum/Fragrance, Cocamide Mea, Propylene Glycol, Sorbitan Oleate, Prunus Amygdalus Dulcis (Sweet Almond) Oil, Citrus Aurantium Bergamia (Bergamot) Fruit Oil, Helianthus Annuus (Sunflower) Seed Oil, Rosmarinus Officinalis (Rosemary) Leaf Extract, Tocopherol, Aqua/Water, Limonene, Coumarin, Linalool.